With “Game of Thrones” George R.R. Martin crafted a universe full of (tons and tons and tons) complicated and complex characters. Many of the main characters have strong, individualized voices and even out of context, almost any quote can be quickly placed to its speaker. In a world of dozens of characters that is no small feat. Samwell Tarly's quotes are usually unintentionally humorous or poignant. Sam is a steward in the Night's Watch and a close friend of Jon Snow. He is played by John Bradley-West on the HBO show "Game of Thrones." While traveling back to the wall with one of Craster's girls, Gilly, and her newborn child, Sam kills a White Walker in an act of bravery. What are some of the best quotes from Sam Tarly? Sam often offers advice to Jon Snow, whether he wants to hear it or not. What are your favorite quotes from Samwell Tarly? 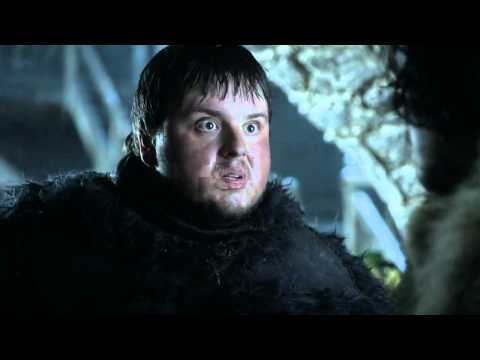 Vote up the best Samwell Tarly quotes below and follow Ranker of Thrones for more quotes from your favorite Game of Thrones characters.